In the aftermath of the Battle of Hoth, the Rebellion lies scattered across the galaxy. Though the Rebels’ strength has dispersed, they will surely reunite and reform unless the Empire can hunt down and destroy the Rebel leaders who have already gone into hiding. 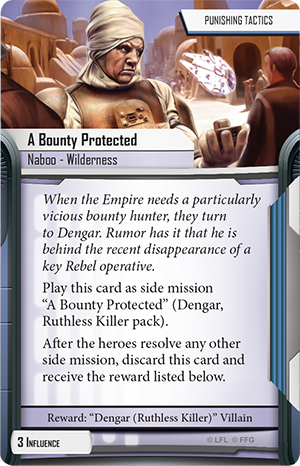 Your hunt for these missing criminals may lead you to unsavory characters, but whether you’re working for the Empire or striking out on your own, your best chance of assassinating the Rebel leaders lies with bounty hunters like Dengar. The Dengar Villain Pack, like other Imperial Assault figure packs, offers a sculpted plastic figure of Dengar to replace the token from the Return to Hoth expansion. This Villain Pack offers far more than a simple plastic figure, however. You’ll find a new three-card Agenda set that you can use to pursue the Rebel heroes through any campaign, while new Command cards and two unique skirmish missions using the Hoth Battle Station map bring new adventures to your head-to-head games of Imperial Assault. Today, we’ll explore the treacherous twists and punishing tactics contained in the Dengar Villain Pack as we look closer at this ruthless killer. Dengar was one of the bounty hunters summoned by Darth Vader to the bridge of the Executor in The Empire Strikes Back, and he earned his place there with his reputation for ruthlessness and wrath. 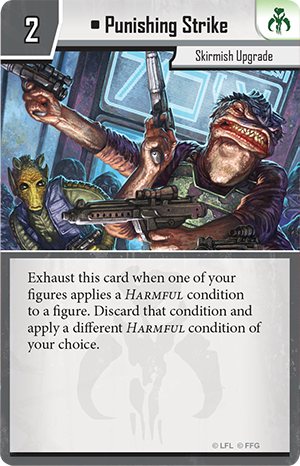 In your games of Imperial Assault, you can use this same unyielding anger to punish your opponent’s figures, one attack at a time. Punishment gives you unparalleled control over how you respond to your opponent’s tactics. If you need to slow down your opponent, you can inflict the Stunned condition. If you want to deal damage, you can inflict Bleeding. You could even Weaken your opponent to reduce their offensive and defensive prowess! And because you can trigger Punishment multiple times with a single attack, you may even inflict all three conditions at once. Of course, you still need surges to trigger Punishment multiple times. Dengar has the opportunity to gain more surges with his Contempt ability: when you attack, if your target doesn’t have a Harmful condition, you automatically apply an additional surge to your attack results. 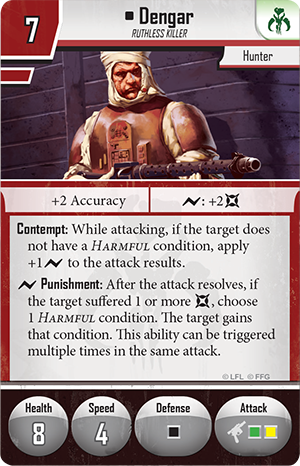 The combination of Contempt and Punishment allows Dengar to roam the battlefield, spreading Harmful conditions to your opponent’s forces at will. Because a figure can never have more than one copy of a single condition, Dengar is of limited use when attacking a figure who already has numerous Harmful conditions. 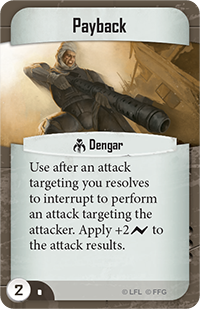 To deal the most punishment to your opponent, Dengar should target your opponent’s figures in turn, dealing conditions and moving on, eventually returning to freshly healed figures if necessary. While Dengar softens your foes for the killing blow, your heavy-hitters can follow in support, taking down weakened figures and eliminating threats while they’re most vulnerable. In your campaigns, Dengar can quickly become an invaluable asset as you hunt down the Rebel heroes. Because the Rebels have a very small pool of figures, the Harmful conditions that Dengar inflicts are even more detrimental. By Stunning, Bleeding, and Weakening the heroes, you’ll enable your other figures to wound them more easily and end the mission in your favor. 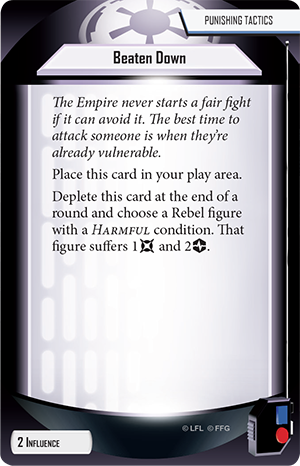 You may also use the new three-card Agenda set included in this figure pack to inflict your punishment on the Rebels throughout an entire campaign. To begin, a new Agenda side mission challenges the heroes to travel deep into the wildernesses of Naboo in search of a key Rebel operative who has been abducted by Dengar. This operative has some extraordinarily vital information, but the mission won’t be easy, and if the Rebels bypass the mission, the Empire can hire Dengar for any future campaign missions. The other cards in this Agenda set give you even more ways to take advantage of the Harmful conditions that you inflict. You may play Targeted Cruelty after an attack applies a Harmful condition to immediately choose another Harmful condition and force the targeted figure to gain that condition as well. Alternatively, you may play Beaten Down on a Rebel figure that already has a Harmful condition. The chosen figure then suffers one damage and two strain, pushing them even closer to becoming wounded. You may choose to hire Dengar for your skirmish games as well, if only to take advantage of his penchant for Harmful conditions. Dengar can be an admirable addition to a skirmish strike team, Stunning, Bleeding, and Weakening enemy figures at will. You may also choose to include the new Mercenaries skirmish upgrade included in the Dengar Villain Pack. Punishing Strike is a new skirmish upgrade that gives you a second level control over the conditions your figures inflict. Whenever one of your figures applies a Harmful condition to an enemy figure, you may exhaust Punishing Strike to discard that condition and instead apply a different Harmful condition of your choice! In effect, if one of your figures can inflict a single type of Harmful condition, Punishing Strike gives it the option to inflict any Harmful condition. By tailoring the conditions you inflict to your situation, you can respond to eminent threats and control your opponent’s figures until you achieve victory. Three new Command cards also enter the playing field for your Imperial Assault skirmishes. If you’re attempting to rush to victory before your opponent can match you, you may play Dangerous Bargains . 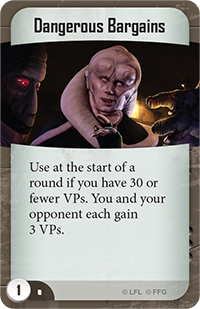 This Command card can only be played if you have thirty or fewer victory points, and it immediately grants three victory points to you and your opponent, pushing both of you closer to the finish line. Alternatively, if figures like Han Solo or the Imperial Officers are decimating your forces by allowing figures to attack outside of their activations, you may play Brace Yourself . 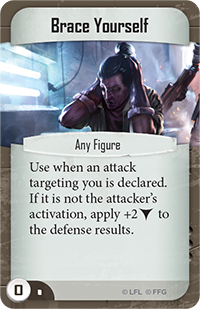 This Command card automatically applies two blocks to your defense results, provided it’s not the attacker’s activation. Finally, you can play Payback , Dengar’s unique Command card that gives him a special edge in any skirmish. You can play Payback immediately after an attack targeting Dengar resolves to let him immediately attack his foolish opponent. You also apply two additional surges to the attack, which offers more opportunity for triggering Punishment and inflicting more Harmful conditions on your hapless target. Whenever Dengar enters the skirmish field, one thing is certain—your opponent will take much more punishment than they’d like. 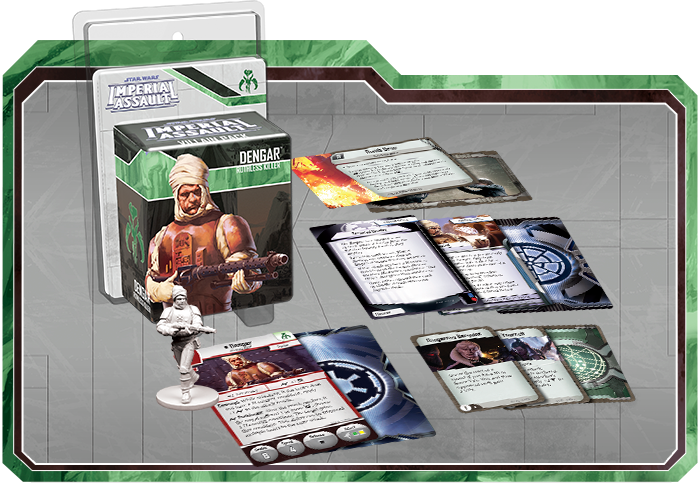 With this Imperial Assault Villain Pack, you have the chance to hunt down the Rebel leaders in a campaign or skirmish game. Take up the hunt with Dengar and decapitate the Rebel Alliance before it can regroup and oppose the Empire once more! 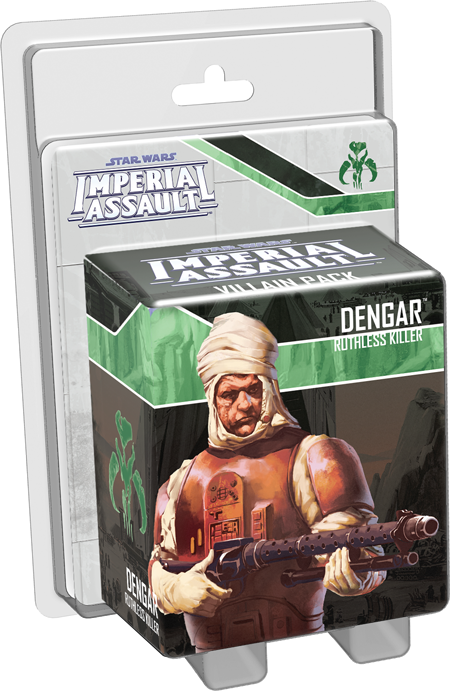 Pre-order your copy of the Dengar Villain Pack at your local retailer today.